On the 27th June national aesthetics group, sk:n held a VIP open day and unveiled their brand new premises situated on Christchurch Road, Bournemouth. sk:n completed a refurbishment and the clinic now boasts state-of-the-art treatment rooms and additional top-spec equipment. The team at sk:n Bournemouth greeted guests on arrival and introduced them to the renowned brand, they explained the wide range of treatments that the clinic offers including; laser hair removal, tattoo removal, skin peels, anti-ageing Injectables, lip fillers, microdermabrasion, thread veins plus much more, as well as the sk:n range of clinically proven skincare and sun-care products. The newly appointed Mayor and Mayoress of Bournemouth Cllr Lawrence Williams and Mrs Elaine Williams, cut the ribbon and officially welcomed the state-of-the-art clinic to the Bournemouth area. Alongside him were members of the sk:n Bournemouth team, national directors from head office, suppliers and VIP guests. 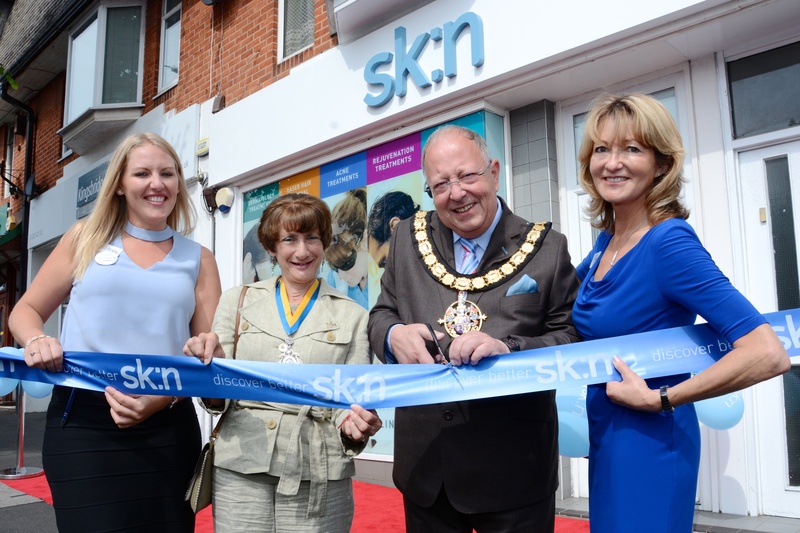 The Mayor of Bournemouth Cllr Lawrence Williams said, “I am delighted to welcome the award-winning national brand sk:n to Bournemouth and officially open their new clinic on Christchurch road. Invited guests enjoyed an exclusive day of skin expertise, which included the chance to watch live treatment demonstrations, take advantage of the free skin health assessments by sk:n experts, trial the products, enjoy nutritious smoothies and snacks and to meet the team behind the new clinic. CEO of sk:n Darren Grassby said “We have been looking at Bournemouth for some time, it is in our opinion, the perfect destination for our 45th clinic with its blue-flag beaches, a premier division football team, as well as being home to thriving banking, tourism, digital and manufacturing industries. For more information about sk:n visit www.sknclinics.co.uk/clinics/the-south/bournemouth-christchurch-road , or visit the clinic at 1070 Christchurch Road, Bournemouth, BH7 6DS.